Did you know dogs like computers too? 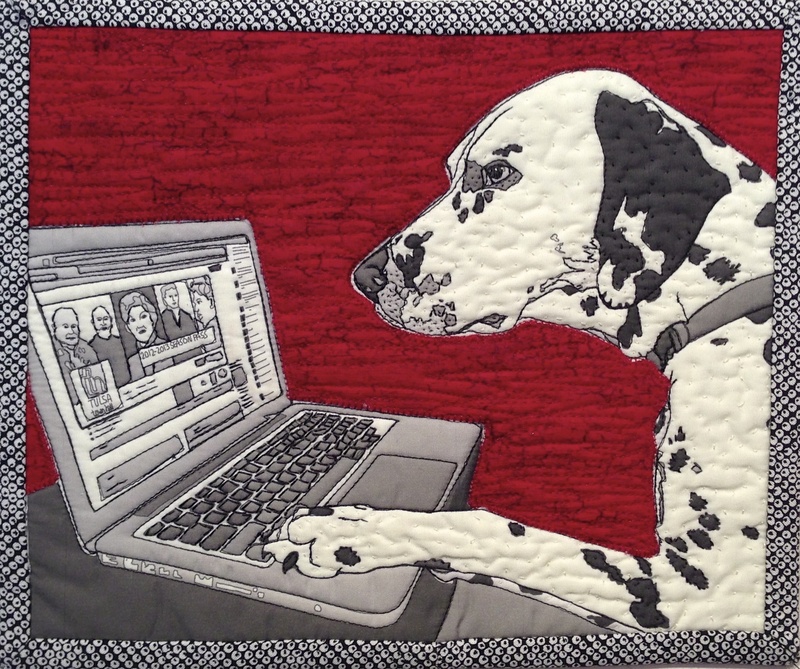 I didn’t either, but when I saw the the photo my long time college friend Lynda Darnutzer Brownson posted on Face Book of her Champion Dalmatian Reggie checking his Tulsa Town Hall Face Book page on his laptop, I knew I had to reinterpret him as an art quilt to help Lynda celebrate her latest birthday. Even though miles and years separate us since our college years at Washington U in St. Louis, we have maintained a tradition of gift exchanges on our birthdays. Reggie’s talents go beyond his Champion dog show status, he is a Renaissance Dog on so many levels. He is often the FACE on Face Book for Tulsa Town Hall* and for Tulsa Reads** (seen below with Lynda enjoying Anna Quindlen’s book “Good Dog. Stay.“). He visits the ill in hospitals, is a new father of 5 pups, and just added another accolade to his long list of wins in the dog show ring. He was awarded Best of Breed at the Bartlesville Kennel Club Dog Show (April 13, 2013). 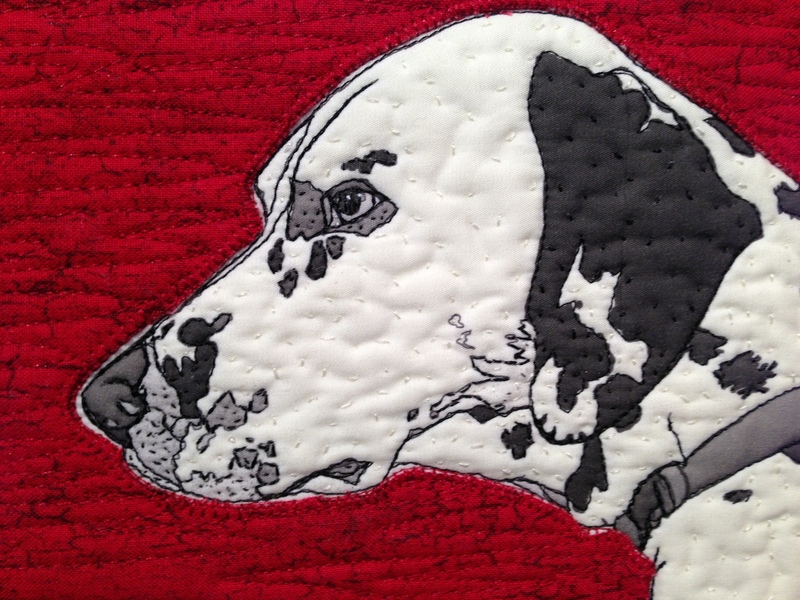 My art quilt demonstrates his computer skills…..what can he not do?? A true wonder dog! Lynda and Reggie reading Anna Quindlen’s book Good Dog. Stay. Using Lynda’s photo, I drew the black and white images on my iPad Tracing Paper app. I printed the image onto fabric on my home printer, added hand and machine stitching, and appliqued red background fabric to frame the black and white images. I look at her beautiful interpretation of my expressive Reggie on the keyboard. That’s marvelous. I now have a new favorite. No doubt Lynda is thrilled. Are you going tomorrow? If so let me know and I’ll pick you up. What fun! And what focus and concentration on that pup’s face! Wow! Love, love, love this!! Great quilt!